We’ll begin our Kirin 960 performance evaluation by investigating the A73’s integer and floating-point IPC with some synthetic tests. Then we’ll see how the changes to its memory system affect memory latency and bandwidth. Finally, after completing the lower-level tests, we’ll see how Huawei’s Mate 9 and its Kirin 960 SoC perform when running some real-world workloads. 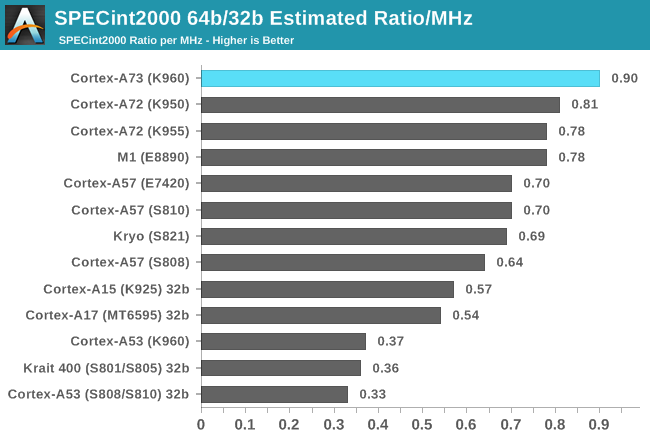 Our first look at the A73’s integer performance comes from SPECint2000, the integer component of the SPEC CPU2000 benchmark developed by the Standard Performance Evaluation Corporation. This collection of single-threaded tests allows us to compare IPC for competing CPU microarchitectures. The scores below are not officially validated numbers, which requires the test to be supervised by SPEC, but we’ve done our best to choose appropriate compiler flags and to get the tests to pass internal validation. The Kirin 960’s A73 CPU is about 11% faster on average than the Kirin 950’s A72. In addition to the front-end changes discussed on the previous page and the changes to the memory system discussed in the next section, the A73’s integer pipelines have undergone a few tweaks as well. Where the A72 had 3 integer ALUs—2 simple ALUs for basic operations such as addition and shifting and 1 dedicated multi-cycle ALU for complex operations such as multiplication, division, and multiply-accumulate—the A73 only has 2 integer ALUs that are capable of performing both basic and complex operations. This affects performance in different ways. For example, because only one of the A73’s ALUs can handle multiplication while the other handles division, the time to execute multiply or division operations sees no change; however, while an ALU is occupied with a multi-cycle instruction, it cannot execute simple instructions like the A72’s dedicated pipelines can, leading to a potential performance loss. Multiply-accumulate operations, which require both of the A73’s pipelines, incur a similar penalty. It’s not all bad, however. Workloads that perform parallel arithmetic or use certain other complex instructions can see double the execution throughput on A73 versus A72. Note that the table above does not account for differences in CPU frequency. The Kirin 960’s frequency advantage over the Kirin 950 and Snapdragon 821 is less than 3%, making these numbers easier to compare, but its advantage over the Exynos 7420 is a little over 12%. The chart below accounts for this by dividing the estimated SPECint2000 ratio score by CPU frequency, making IPC comparisons easier. Despite the substantial microarchitectural differences between the A73 and A72, the A73’s integer IPC is only 11% higher than the A72’s. This is likely the result of improvements in one area being partially offset by regressions in another. Still, assuming ARM’s power reduction claims hold true, this is not a bad result. The gap between the A73 and A57 increases to 29%. The integer performance for Qualcomm’s custom Kryo core is well behind ARM’s A73 and A72 cores, essentially matching the A57’s IPC. The updated Geekbench 4 workloads give us a second look at integer IPC. Similar to the SPECint2000 results, we see Kirin 960 showing 5% to 15% gains over Kirin 950 in several of the tests, but there’s a bit more variation overall. The Kirin 960 is actually slower than Kirin 950 in some tests, and, in the case of Canny and Histogram Equalization, its A73 is even slower than the Exynos 7420’s A57. It also falls behind Qualcomm’s Kryo in the JPEG, PDF Rendering, and Camera tests. The tests where the Kirin 960 does well—HTML5 Parse, HTML5 DOM, and SQLite—are very common workloads, though, which should translate into better real-world performance. The chart above accounts for differences in CPU frequency, making it easier to directly compare IPC. Overall the A73 shows only about a 4% improvement over the A72 and about a 12% improvement over the A57 in this group of workloads, considerably less than what we saw in SPECint2000; however, with margins ranging from 33.5% in Dijkstra to -16.1% in Canny, it’s impossible to make any sweeping statements about the A73’s integer performance being better or worse than the A72’s. Qualcomm’s Kryo CPU falls just behind the A57 once again despite posting better results in many of the Geekbench integer tests. Its poor performance in LLVM and HTML5 DOM weighs heavily on its overall score. I’ve also included results for ARM’s in-order A53 companion core. 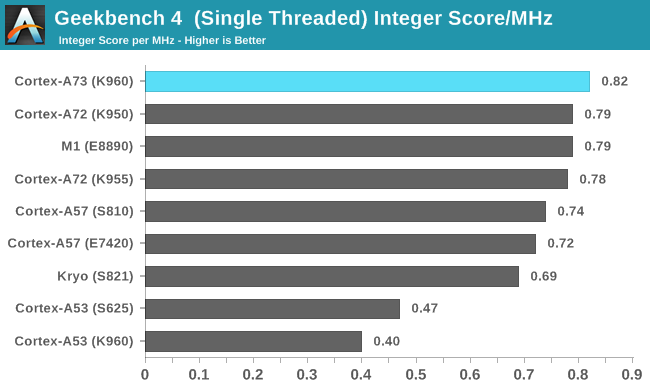 The A73’s integer IPC is 1.7x to 2x higher overall, which illustrates why octa-core A53 SoCs are so much slower, particularly in Web browsing, than designs that use 2-4 big cores (A73/A72/A57) instead of 4 additional A53s. With the exception of SFFT and Speech Recognition, the Kirin 960 is generally a little slower than the Kirin 950 in Geekbench 4’s floating-point workloads. 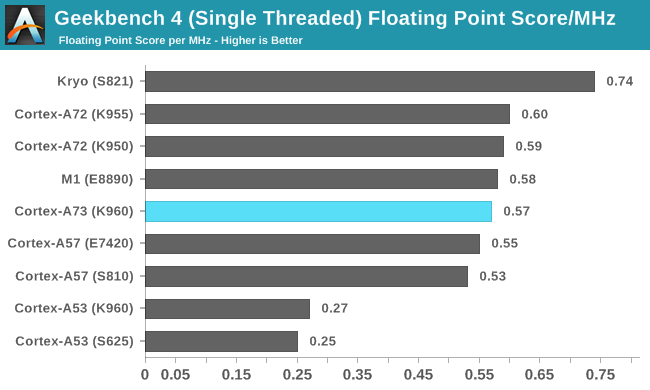 This is a bit of a surprise considering that the A73’s NEON execution units are relatively unchanged from the A72’s design, with reduced latency for specific instructions improving NEON performance by 5%, according to ARM. These results are even harder to interpret after factoring in the A73’s lower-latency front end and improvements to its fetch block and memory subsystems. It’s possible that some of these tests are limited by the A73’s narrower decode stage, but given the variation in workloads, this is probably not true for every case. It will be interesting to see if A73 implementations from other SoC vendors show similar results. After accounting for the differences in CPU frequency, floating-point IPC for the Kirin 960’s A73 is 3% to 5% lower overall than the A72 but about 3% higher than the older A57. These results, which are a geometric mean of the floating-point subtest scores, are certainly closer to what I would expect, but hide the large performance variation from one workload to the next. It’s pretty obvious that floating-point performance was Qualcomm’s focus for its custom Kryo core. While integer IPC was no better than ARM’s A57, Kryo’s floating-point IPC is 23% higher than the A72 in Geekbench 4, with particularly strong results in the Gaussian Blur and HDR tests. "Only Huawei phone worth buying is the Nexus 6P [...]. This won't change even if/when they actually do make better hardware." "Only Huawei phone worth buying is the Nexus 6P and still remains so. This won't change even if/when they actually do make better hardware." A lot of reviewers take free bread. Especially ones that aren't making enough off ads alone, or that have a personal slant, etc. I'm not saying that includes AC, but you shouldn't dismiss it so casually either. The most effective place to apply grease is reviewers and review sites. The Kirin 960 is obviously a step sideways, so to give it glowing reviews is hilarious. A lot of internet commentators are paid to praise one sine or company and accuse competing ones. This is an undisputed fact so you shouldn't dismiss this casually. The point wasn't whether AC is or isn't on Huawei's payroll but rather the attitude of the person commenting who basically disqualified themselves by saying that "even with better products they will never be worth buying".That sound like the user doesn't actually care about the product or the facts, and is only here to criticize Huawei and anything that might be related to them.